UPDATE: This place is now CLOSED and out of business. Located next to Famima!! 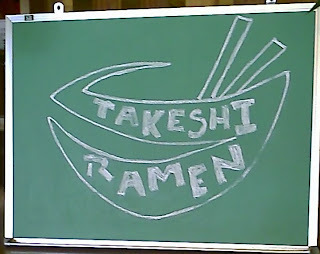 on Brand Boulevard, this ramen-ya is far from any other. It doesn't seem to be japanese owned or operated but nevertheless, it's good to see a ramen-ya where you wouldn't expect to. After reading the review on rameniac, I went in with some low expectations, but surprisingly it wasn't as bad as it seemed. My only complaint would have to be the service. I happened to walk in on the day the new waitress was starting and she had no clue what she was doing. But I don't blame her since there was nobody even training her. 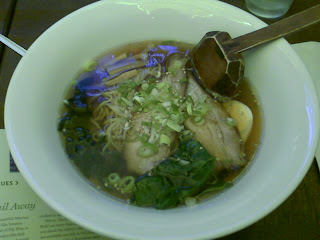 Shoyu-ramen: The picture may not show it, but this ramen was a delightful surprise, especially the soup. The soup was very light with a crisp flavorful taste that was definitely not overbearing. The noodles had a nice texture that also separated it from being just average. The toppings (chashu, menma, seaweed, spinach, scallions, and egg) complemented the overall ramen as you would expect. The chashu was a little dry but not as thin as rameniac noted (they must have read the review too). Fried Gyoza: I thought I had ordered the traditional gyoza with my lunch special but perhaps the new waitress wrote it down wrong. Nevertheless, I'm always welcome to try something different. 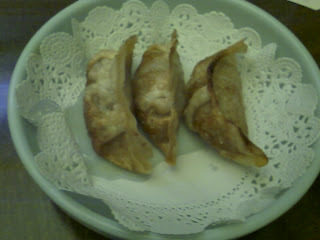 Like a fried wonton, this gyoza is very crispy and crunchy. The intense garlic flavor pierces your tongue as soon as your teeth sink into the crispy shell. Definite vampire killer. I fully recommend adding this to your ramen although I will have to try the traditional gyoza next time and determine which is better. I have a feeling that the traditional gyoza will be better. If you've tried it let me know in the comments! I'd hate to tell that Famima is closed in Glendale.